But I don’t really commute anymore, or drive as much as I used to. 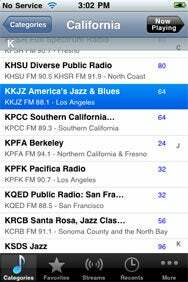 When I am in the car, though, I find myself usually tuning to KKJZ out of Cal State University Long Beach, arguably the best jazz and blues station in the country. It’s a public station, depending on listeners’ financial contributions to survive. I’ve given a few hundred bucks over the years—enough to assuage my guilt, but just barely. Well, with Internet radio supplanting my “terrestrial” listening, I might have to send another $50 to help offset their bandwidth costs. Public radio fans, it turns out, have a couple of sound options for listening to their favorite stations on their iPhones or iPods. We've covered a few public radio apps for the iPhone in the past; here are two more for your consideration. Dialed In: Public Radio from Intersect World lets you browse public radio stations by state and by call letters. Intersect World’s Public Radio app is a simple radio stream aggregator. It lets you browse public radio stations alphabetically by call letters and grouped by state. The $2 app also keeps track of your listening history and lets you bookmark favorites, a standard feature among several Internet radio applications. The app boasts some nice social networking features, as well. You can share your stations via Twitter and Facebook, and by e-mail of course. You can also visit stations’ Web sites from the app, but be advised that will cut off your stream. The most recent update of Public Radio, optimized for software update 3.0, seems to have killed some bugs. The app hasn’t crashed on me as it did several times previously. The developers should consider emulating Public Radio Exchange’s free Public Radio Tuner app, which lets users search by programming category as well as city or station call letters. Intersect World’s app inexplicably lacks a formal search feature. With more than 320 public radio stations on offer, I cannot be the only one who would find it helpful to filter my browsing by jazz, classical or alternative music stations. I’m sure others wouldn’t mind perusing news and talk stations as well. Location, Location, Location: Launch Public Radio Tuner, and it will use the device’s location features to find stations within a 50-, 250- and 500-mile radius of where you are. PRX’s tuner, an earlier version of which Macworld reviewed in March, has another big advantage over Public Radio, apart from price: It actually uses the iPhone’s and iPod touch’s location features. When you launch, the app will ask if it can use your current location. 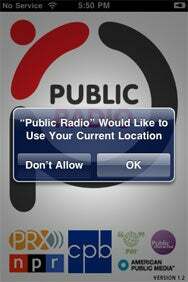 Tap the Local button in the menu bar at the bottom of the screen, and Public Radio Tuner will show you stations within a 50-, 250- and 500-mile radius of your current location. Intersect World’s app asks for your location, too, but does nothing with the information. I can only presume a feature is forthcoming. The older version of Public Radio Tuner had a big drawback: It would drop streams more often than commercial radio stations switch formats. Some users have complained about the new version, which was released with a new buffering code and a new iTunes App Store URL. But I haven’t experienced any problems so far. And as I already mentioned, Intersect World’s app seems to have more bugs to contend with than Public Radio Tuner. Other than a more graphically pleasing interface, Public Radio Tuner is more minimalist than its counterpart. The tuner will launch the last stream you played at start-up, and you can bookmark favorite stations, but the app doesn’t have the e-mail or social networking features of Public Radio. On balance, the PRX is the slightly better application on the basis of its interface and price. Intersect World has done a commendable job working out the bugs of earlier versions. If it can improve the app’s search function, it will be a real contender. For now, however, use the free tuner and pass the savings along to your favorite station during the next pledge drive. The applications are compatible with any iPhone or iPod Touch running the iPhone 2.0 software update or later.